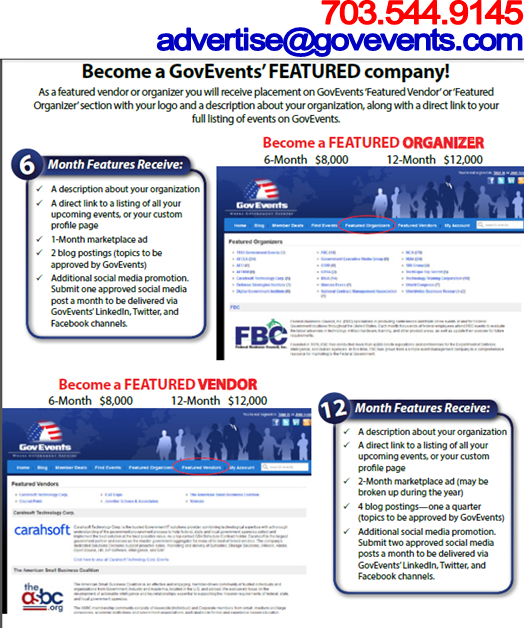 Want to be a Featured Organizer? Find Out How! Federal Business Council, Inc. (FBC) specializes in producing conferences and trade show events at and for Federal Government locations throughout the United States. Each month thousands of federal employees attend FBC events to evaluate the latest advances in technology, military hardware, training, and other product areas, as well as update their sources for future requirements. Founded in 1976, FBC has conducted more than 4,000 onsite expositions and conferences for the Department of Defense, Intelligence, and civilian agencies. In this time, FBC has grown from a simple event management company to a comprehensive resource for marketing to the Federal Government. 1105 Public Sector Media Group provides information, insight and analysis for the government and defense information technology industry, as well as coverage of federal employee news and issues. Our content platforms include print, digital, online, events and a broad spectrum of marketing services. The Public Sector Media Group is a leading producer of government exhibitions, conferences and executive IT events including ACQUIRE, Enterprise Architecture, Federal IT Acquisition Summit and Washington Technology Industry Days. 1105 Media is based in Chatsworth, CA, with primary offices throughout the United States. For over 11 years, Digital Government Institute has provided leading-edge education programs on the most important topics facing government IT managers. DGI is a trusted resource for delivering knowledge through training programs, seminars, conferences and expos, webinars and knowledge centers. By connecting these communities in person and online, this is a truly comprehensive, integrated approach for addressing the most important topics facing government IT and management professionals. DGI's Executive Management Team has over 45 years event and media experience, and is committed to excellence by providing opportunities for the government IT community to connect, collaborate, and share experiences. And as a trusted education provider, DGI has been reviewed and approved as a Registered Education Provider by the Project Management Institute (PMI). The Institute for Defense & Government Advancement (IDGA) is a non-partisan information based organization dedicated to the promotion of innovative ideas in public service and defense. We bring together speaker panels comprised of military and government professionals while attracting delegates with decision-making power from military, government and defense industries. In addition to our live events, IDGA also offers an online community dedicated to providing defense industry professionals with breaking defense news, business opportunities, introductions, podcasts, webinars, and presentations from key industry leaders. Carahsoft Technology Corp. is the trusted Government IT solutions provider, combining technological expertise with a thorough understanding of the government procurement process to help federal, state and local government agencies select and implement the best solution at the best possible value. As a top-ranked GSA Schedule Contract holder, Carahsoft is the largest government partner and serves as the master government aggregator for many of its best-of-breed vendors. The company's dedicated Solutions Divisions support proactive sales, marketing and delivery of Symantec, Storage Solutions, VMware, Adobe, Open Source, HR, HP Software, Intelligence, and SAP. TECHEXPO Top Secret is the Nation's premiere producer of professional job fairs for Security-Cleared professionals. With nearly 900 shows produced, TECHEXPO Top Secret has helped thousands of companies recruit the best talent in the industry and provided hundreds of thousands of professionals with a forum to advance their career. The hiring events focus on a multitude of industries including Cyber Security, Information Technology, Engineering, Aerospace, Telecom, Project Management, Intelligence, Operations, Homeland Security, Research & more. Located around the world, AFCEA's more than 140 chapters and sub-chapters give engineers, programmers, managers, government officials and military personnel continuing opportunities to exchange ideas about communications, intelligence, imaging and information systems technologies. Nearly one-half of AFCEA's chapters conduct symposia and seminars in addition to other chapter activities. National Conference Services, Inc. (NCSI), is a dynamic event planning, production and support services company under contract to multiple federal agencies, primarily within the Department of Defense (DoD) and Intelligence Community (IC). Since 1997, NCSI has served our government clients through large information technology conferences, industry days, meetings and technology expositions, as well as on-site staff augmentation. NCSI is also the leading provider of on-site tabletop technology expositions which are held each year at numerous federal locations around the world, including most military bases of significant size.